For the first time in 42 years the first night of Chanukah and Christmas Eve are falling on the same day!!! That is pretty darned special! For those who celebrate Chanukah, we send wishes for a great "Eight Crazy Nights", for those waiting for Santa, be sure to get to bed early and put those toys away, you don't want him to fall! Now, we know many of you have seen this fabulous video that was made by the Mom of Peaches & Paprika, but, even if you have, it is worth seeing again, if you haven't seen it, ENJOY!! We hope to post the email and snail mail cards that we LOVE and THANK YOU for sending, on our blog on Christmas Day or December 26th. I have been having HUGE spam email trouble since Friday (hundreds coming in at a time), so if I can clear that up, hopefully I can post the cards. We love you and appreciate you all, and however you are celebrating tonight, be safe, have fun and enjoy!!! A very Merry Christmas and Happy Chanukah to all! Happy Chanukah to you dear friends! May your upcoming year be filled with many blessings, joy and friendship. We love you dearly!!! Happy Hanukkah, Caren, to you all! Have a Blessed holiday! The slide show is wonderful, maybe next year I'll be on time to join the fun! Happy Chanukah dear Caren and family. Oh how cool! Happy Chanukah guys. We have some Christmas cleaning to do today because we definitely don't want Santa to trip on toys while delivering presents BOL. Thank you Flynn! Merry Christmas! Oh what fun the video was to see. Thanks Astro! Hey! How come you never visit my doggy brother's blog? I'm a CAT!! MOL!!! Merry Christmas!! 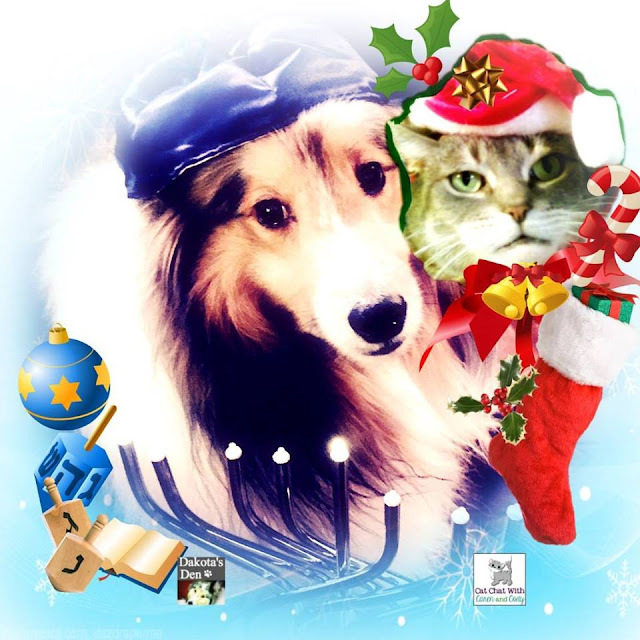 Happy Chanukah and Merry Christmas Cody & Caren! That is really special that both are falling on the same night this year...much love to you! Hope all gets sorted out quickly! Chag Sameach and Merry Christmas to you, dear friends! We hope your holiday season is filled with wonder and miracles and joy! What a lot of fun catabrating and other such delightful things were going on while the petcretary was working! My in-laws were in New Jersey this year for the holidays. So I missed out on latkes this year. Happy Chanukah!